Walden Pond Press, 9780062385581, 288pp. Eleven masters of suspense—Kelly Barnhill, Michael Buckley, Adam Gidwitz, Adele Griffin and Lisa Brown, Claire Legrand, Nikki Loftin, Daniel José Older, Dav Pilkey, R.L. Stine, and Rita Williams-Garcia—have come together to bring you a bone-chilling collection of original ghost stories with illustrations by Gris Grimly, perfect for sharing around the campfire, reading under the covers with a flashlight, and scaring your friends’ pants off. 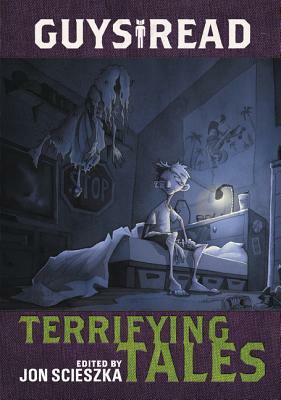 Compiled and edited by kid-lit madman Jon Scieszka, Guys Read: Terrifying Tales is a creepy-fun read (if you’re brave enough, that is). Gris Grimly is a children's book illustrator who moonlights in painting and filmmaking. Some of his best-known works include Gris Grimly's Frankenstein, Edgar Allan Poe's Tales of Mystery and Madness and Edgar Allan Poe's Tales of Death and Dementia, and Neil Gaiman's bestselling picture book The Dangerous Alphabet. He lives in Los Angeles. Lisa Brown is the New York Times bestselling illustrator of How To Be, Sometimes You Get What You Want, and the New York Times bestselling book The Latke Who Couldn't Stop Screaming. She lives in San Francisco with her husband and son.